Water is symbolic if the vitality of life and is key to the sacredness of a healing garden. Water can be metaphorical of peace, tranquility and calm. Conversely, it is also associated with vitality, fertility, abundance, fluidity and movement. Water opens up the contemplative nature of the soul and helps to elicit memories and a sense of belonging. Because water is a feminine energy, it is also associated with the Goddess and with the mother's womb. Water can be incorporated in any of its many guises: as a gushing stream in a fountain it is symbolic of the life force (chi, prana), of surmounting obstacles, and initiating new life. As a slow moving, meandering stream or creek, water is symbolic of the river of life and our personal life path. It is therefore also allegorical of progress and attainment. As a waterfall, it is symbolic of a leap into the unknown, of courage, and triumph over fear. As a still pond or pool, water is symbolic of contemplation, of the soul's yearning for truth, renewal and healing. Water that disappears into the earth, a cave, or crevice is allegoric of the cycles of life and death and can be a reassuring symbol of our ability to overcome even the most dire circumstances. Adding a bridge over moving water is a powerful symbol of our ability to overcome obstacles. It also helps to define the journey within the garden and to create a sense of natural transition into a more pristine environment. Introduce water as early as possible in the sequential experience of the garden: a purification bowl at the entrance helps to lower stress and is symbolic of our respect for nature and the divine. This bowl can include river stones and sea shells. Water can be designed to encourage interaction with wildlife: songbirds, butterflies, humming birds. It is important to avoid using pesticides or chemical cleaners such a chlorine or potassium. Use only animal-approved pond liners and bird baths. Provide bird baths and feeders to encourage use of water features by wildlife. However, make sure you provide enough security from potential predators by setting back water stations away from other objects and by placing them in the line of normal bird flight. Include sandy soil for bird preening and digestion. Try to incorporate natural objects into water features: sea shells, hollow rocks, stone bowls, tree stumps. Provide some very shallow water for its reflective qualities: include rocks and allow some to be only partially submerged so they can act as launching pads for birds and butterflies. Encourage frogs and snails. Provide pools for fish and water lilies. Always provide sitting opportunities near water features both for the view as well as the sound. Use water features to showcase art or other anchor features: trees, rocks, or flowers. Water can enhance the drama of a particular setting and soften harder surfaces such as stone or brick. Design water to mask unpleasant ambient sounds. However, be conscious of the need for a natural sound: avoid plastic and metals as much as possible and make sure pumps are as sound-proof as possible. Hide all mechanical components, pumps, hoses, and pond liners. 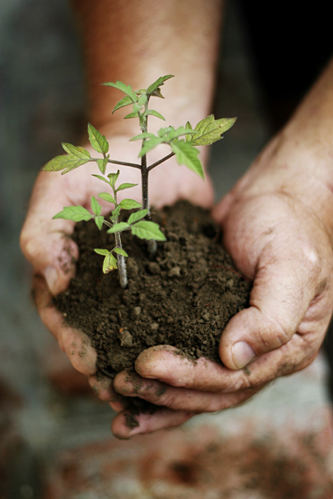 The Earth provides nurture and support to life; it is the foundation of all that is material. The earth is the matrix (mother) on which the creative power of life is made manifest. Rocks, trees, plants and animals are the Earth's manifestations. Careful consideration of these components will yield a garden that will greatly enhance healing and recuperation. Consider the possibility of working in concert with the spirit of the land. Known as the genius loci, the earth's power can be tapped if you are conscious of its laws and if you pay homage and respect to its manifestations: rocks, land formations, trees and vegetation, wildlife, and the spirit that animates them. To achieve this include plenty of variety of plants and wildlife, incorporate seasonally different flowerings, attract wildlife with feeders, birdbaths, and edible plants, seeds, berries, and nuts. Include water features and visually interesting anchor points. Use rocks and stone to connect directly to the earth. Incorporate views of the sky and of the changing clouds: frame views to isolate special features of the topography or climate with greenery or architecture: connect the earth with the sky. Use rocks and trees to elevate the spiritual power of the healing garden. Create a landscape by using rocks and trees to simulate larger geographical regions. Think of rocks as mountains, pools as lakes, trees as sacred groves. Consider orientation, sun angles, and sequences of experience. Balance rock formations with water and vegetation. Use rocks as a counterpoint for larger masses of greenery. Run water through, over, and under rocks. Use rocks to define paths, frame flower beds, create edges and transition zones, as water features, and as altars or shrines. All of these enhance the drama of nature and provide visual relief from plants and flowers. They are also useful perches for birds, butterflies and insects. Create an anchor point out of a mature tree or plant grouping. Surround this with colorful flowers, a meandering pathway, and a sitting area. Encourage casual conversation under its canopy and promote social interaction in its shade. Consider a shrine as a possible use for a mature tree. Create areas where you can walk directly on the earth: stone pavers, soil, pebbles, moss, wood planks, sand. Provide pathways that are accessible to the infirm and disabled through these areas. However, do not assume that all patients are disabled. Create sitting areas to take advantage of these rock and tree formations. Honor the spirit of the place by creating a shrine or place of offering. This can be a cairn (a pile of stones or crystals), an altar proper, or an icon or deity. Make offerings at this shrine on a regular basis. Use crystals and more precious minerals as a way of connecting to higher forms of consciousness. Introduce a labyrinth as a form of moving meditation. Add a chapel, pavilion, or some other enclosure to provide a destination or purpose. Provide shelter where needed. Provide for outlets of personal expression: include patients and staff in the design and creation of rock and tree features. If pathways are symbolic of the healing journey, sitting areas are the stations that mark our recuperation. Sitting areas are an essential component of a garden. They provide respite, regeneration, and an opportunity to socialize, comfort, contemplate, and enjoy. Create a variety of possibilities: shady private spots for communing with trees or listening to a waterfall, more open areas where you can join others for conversation or a snack, and yet larger spaces for communal meetings, lectures or entertainment. Each of these has a valid purpose, but they should all be able to function without encroaching on each other's peace, purpose, or potential. Have a clear purpose or intention in mind for each sitting area. This can be for aesthetic pleasure, contemplation of wildlife, conversation, bereavement, etc. Each patient population will have its own requirements: research these needs and find ways of combining multiple uses if possible. Select a specific type of sitting structure for each purpose. Each type should fit the purpose not only in terms of form, but also in its materials, construction and emotional tone. Avoid plastics and generic garden furniture. Select views and sequential experience of each sitting area carefully: it is important to allow for time to move slowly between each sitting opportunity. Carefully select foundation plants, trees, and shrubs to create focal interest around sitting areas. These should work year-round or at least for 3 seasons. Winter is a powerful healing force that should not be neglected. Layer smaller plants, flowers, grasses, and ground cover around the focal point. Make sitting areas accessible: provide paths and dimension sitting elements to be usable for those with infirmities and disabilities. Provide chairs and benches with arm rests and solid backs. Make sure the view from the sitting area is inspiring and free of clutter and congestion. Conceal larger equipment, pumps, hoses, and tools. However, a potting table or a gardener's shed is an iconic reminder of harmony with nature and could be used therapeutically. If the view is bland or not inspiring, add interest through art, water features, chimes, and other anchor points such as rocks, sculptures, or plantings. If you have more than one sitting area, let each one reflect a different mood or purpose. These can be meditation, contemplation, shady privacy, viewing sunsets or sunrises, outdoor dinning, wildlife viewing, flower gazing, taking in sounds or scents,etc. Encourage the use of sitting areas: let them become saturated with the feeling of peace and gratitude. Encourage wildlife in the vicinity of sitting areas. Introduce safe animals: turtles, frogs, rabbits, fowl. Provide a secure backing formation behind the sitting area: This can be a solid wall, a hedge, bushes, or a tree. A strong backing formation provides psychological security. Avoid sitting areas open on all sides. Provide sitting opportunities near the entrance to the garden: this is a favorite spot for the weak and the infirm. Provide shelter where needed. Add a chapel, pavilion, or some other enclosure to provide a destination or purpose. Color and light are the soul of a healing garden. More than any other quality, it is the ephemeral interplay of tones, hues, and changing intensities that draws out our own soulful understanding of life and its incredible variety and beauty. Because color is transitory in nature, color also helps us to understand our own mortality. The result is an acceptance of life and our healing journey. Although there are many theories of color, it is best to work intuitively. A skilled gardener is one that follows the lead of the heart. Color is symbolic of memory, relationships and personal essence and serves also as a powerful symbol of the internal essence of each life form. These cannot be understood intellectually. It is b1st to keep color schemes simple and to build resonances gradually. Color should be integrated with forms, and should exalt rocks, water features, and vegetation. It should be added only as the need arises. It is important to sit and observe the play of light over time. It helps to know the flowering times of plants in your region and how they will behave in the particular setting you have chosen. Consider how much drama you wish to create: is it best to show color in full blast, or as a sequence or layering over time? Light is particularly tricky in closed areas and northern latitudes. It is important to know what your plants will need and how it will affect foliage colors, texture patterns and their interplay with stone and water. In general terms it is helpful to create areas of shadow and sunlight that can encourage different activities. Often a shaft of light that penetrates into a shady area will create some of the most desirable effects. Enhance this with the appropriate color combinations and background vegetation. Remember to integrate foliage and leaves into the color scheme. This is particularly important in gardens that will not support luxurious flowering. Artful combinations of greens can run the gamut from silvery to almost yellow and can include dry species that will turn red or orange for winter viewing. It is important to work with the maturity traits of your plants. Know their height, width, and light needs in the conditions they are exposed to. This will help to prevent smothering of shorter or weaker species. Although color appreciation is subjective, there are some basic qualities that are universally agreed upon. Red, for example is symbolic of passion, activity, courage and helps to reduce depression and lethargy. It should be used sparingly as it can make the garden feel smaller. Orange is similar to red and will stimulate the nervous system, enhance will power and vitality. It helps to reduce monotony and lack of motivation. Yellow is cheerful, warm and stimulating, It is symbolic of clear thinking, harmony in relationships, and family life, and will stimulate the nerves and the brain. Green is the color of peace, growth and renewal. It supports knowledge, wealth and family. Blue/indigo is the color of spirituality and helps to induce calmness, sincerity and rest. Used excessively it can induce passivity and depression. It stimulates knowledge, a sense of mission, and career. Violet/purple is the soulful aspect of the self. It signifies deep love, mystery, contemplation and the unconscious. It needs to be surrounded by brighter colors. White is the color of purity and of the matrix on which all other forms and colors are laid. Is stimulates our spirit and helps to release distractions.